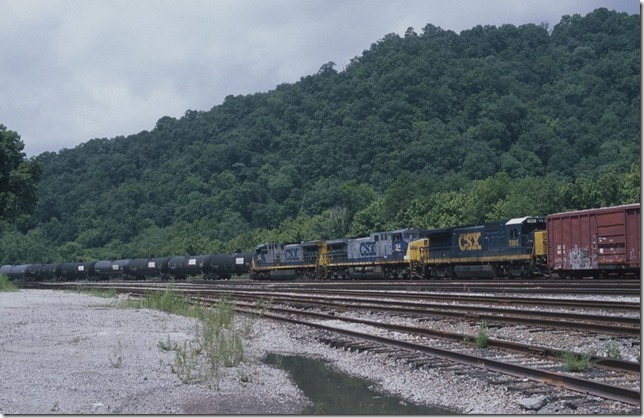 All of these were made withy my new SilverFast SE slide scanning program. Nikon Scan wouldn’t run on my newer Windows 7, so after several months I tried and bought SilverFast for my Nikon Coolscan V ED. I’m still learning the program. 1. 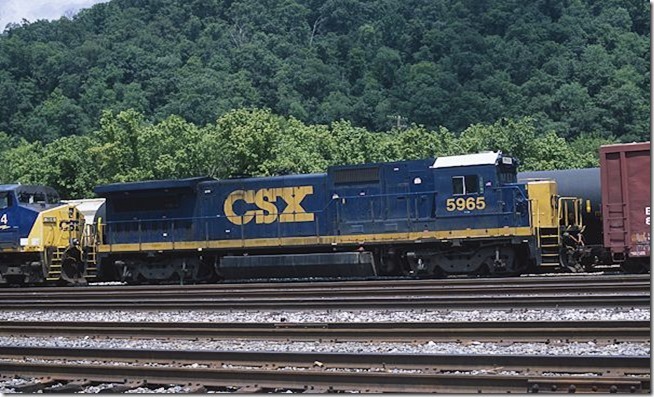 CSX Q697 arrives Shelby with 76 cars behind 425-164-5965. 7-22-12. 2. B40-8 5965 is a rare unit these days. 3. C40-8 7577 at east end of Shelby yard. 8-11-12. 4. 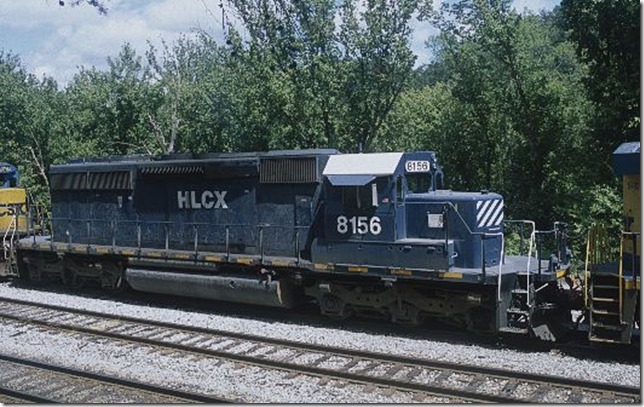 HLCX SD40-2 8156. 8-11-12. 5. 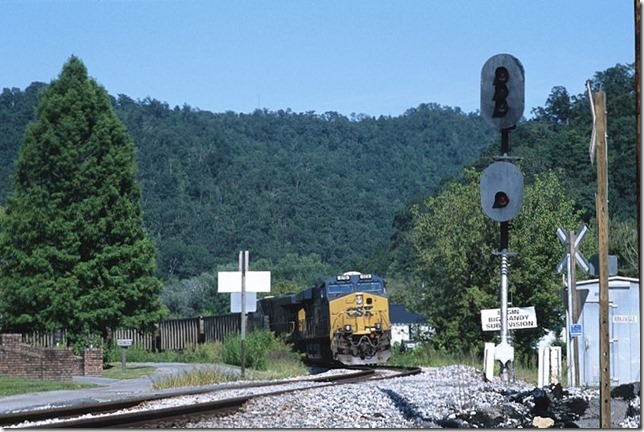 CSX 5492-HLCX 8156-7577 knuckle down on the steep grade at Elkhorn City with 107-car southbound ethanol train K459-09. 8-11-12. 6. 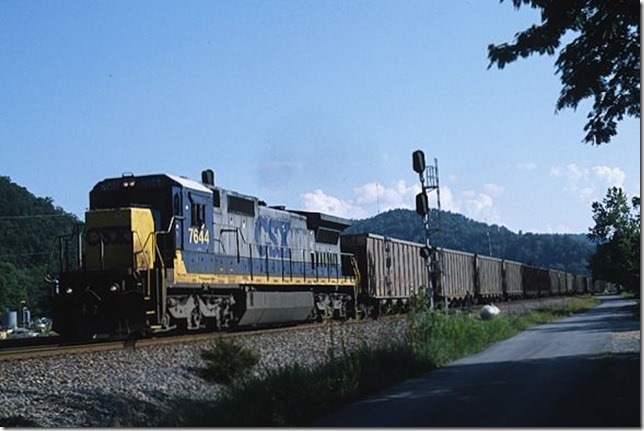 CSX 5492-HLCX 8156-7577 knuckle down on the steep grade at Elkhorn City with 107-car southbound ethanol train K459-09. 8-11-12. View 2. 7. 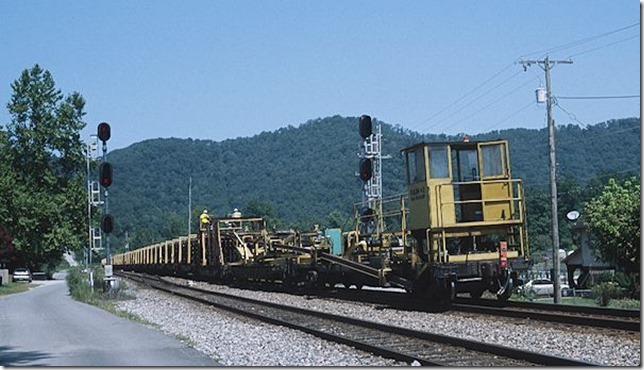 Pusher 5399 will stay on to Dante, Va.
8. 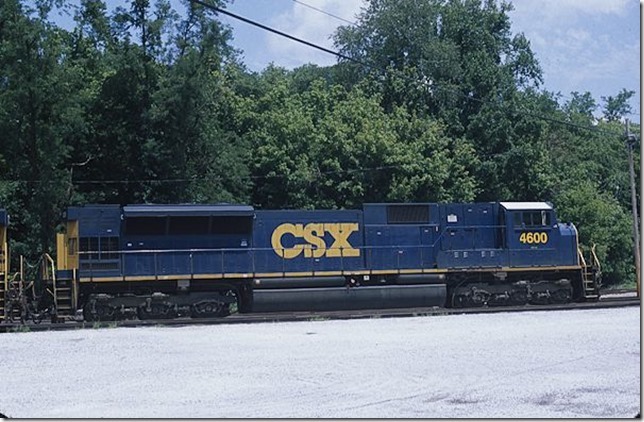 SD80MAC 4600 at Shelby on 7-22-12. 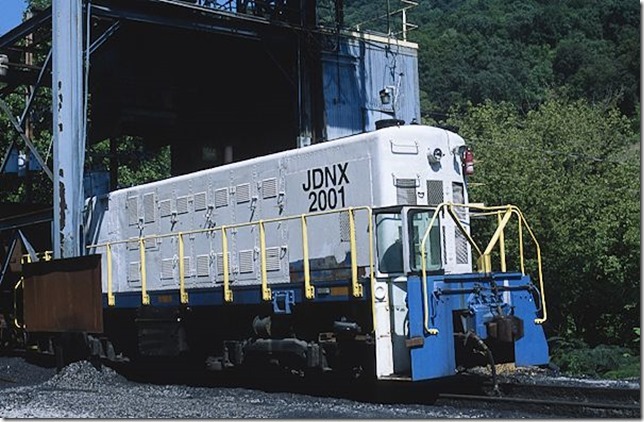 This is an ex-Conrail unit. 9. 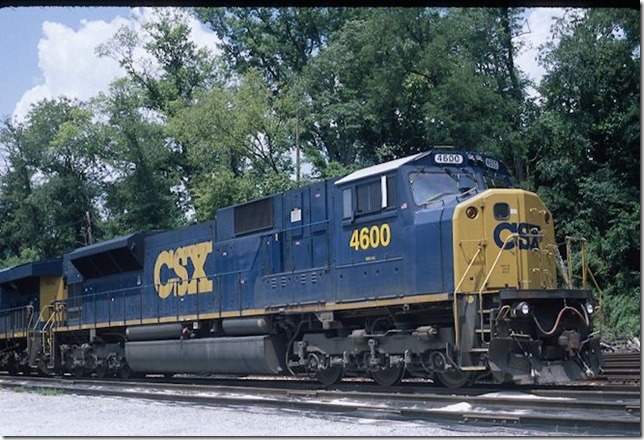 4600 is one l-o-n-g engine! 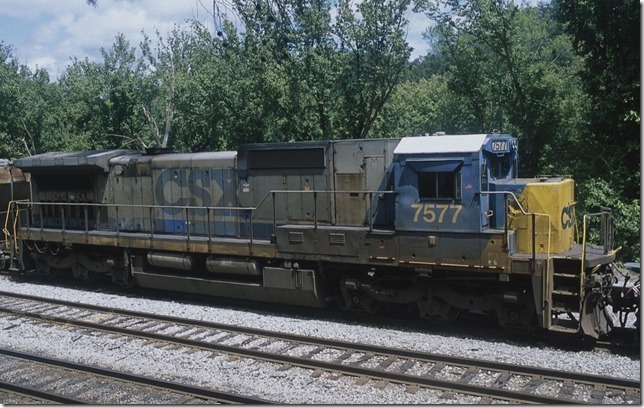 NS also got part of Conrail’s fleet. 10. 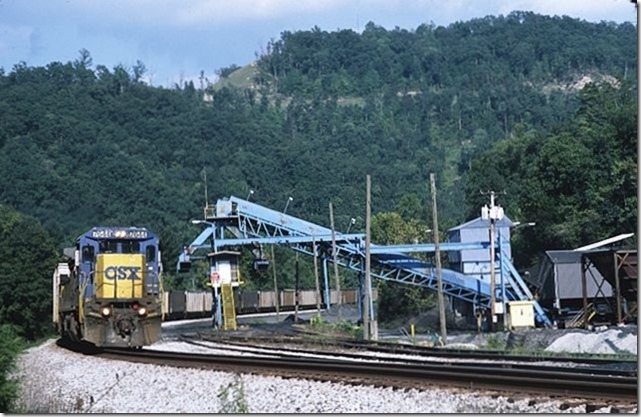 Excel Mining uses re-engine cabless ALCo JDNX 2001 at their Scotts Branch Mine near Meta, Ky. 8-25-12. Chase Freeman and I were out railfanning this Saturday. 11. 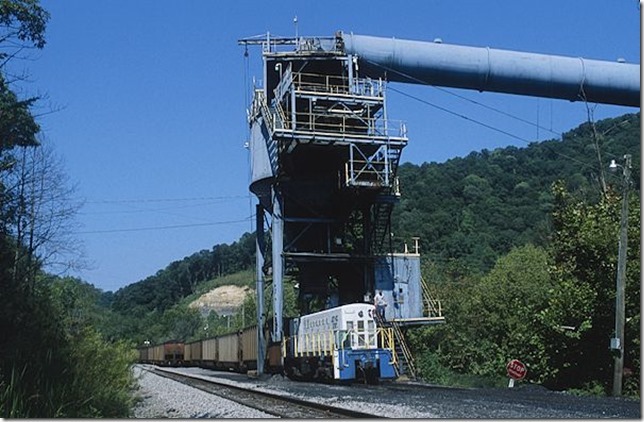 Excel Mining uses re-engine cabless ALCo JDNX 2001 at their Scotts Branch Mine near Meta, Ky. 8-25-12. 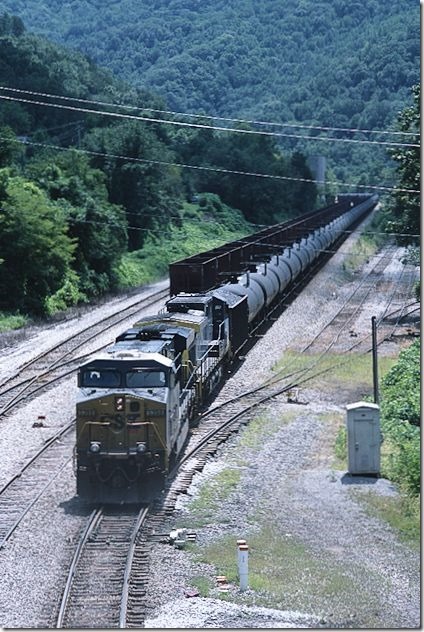 Chase Freeman and I were out railfanning this Saturday. View 2. 12. Westbound rail train F041 passes Beaver Jct. 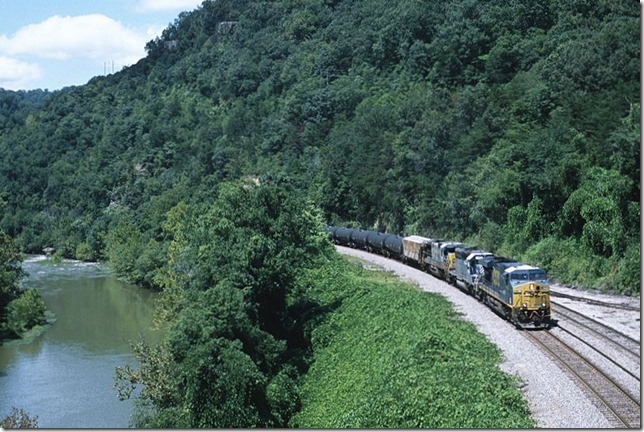 at Dwale, Ky. 8-25-12. 13. Westbound C882-25 (Shelby to Martin) has a medium approach slow signal on No. 1 at Beaver Jct. He will pull through the crossover #1 to #2 and stop at EM Cabin. 14. C882-25 pulled west on the No. 2 to EM Cabin (west end of double track), cut off from his train, returned to Beaver Jct. where he crossed from the #1 (main) to #2. 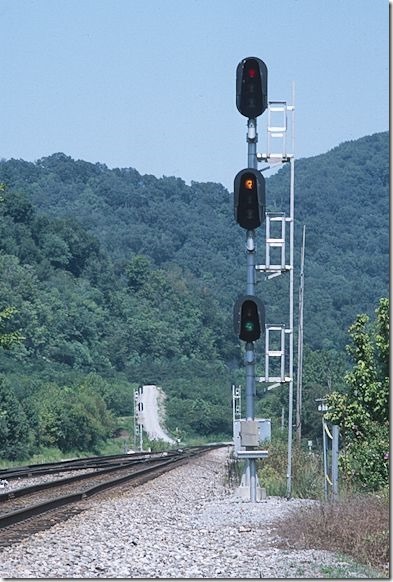 Now he looks at a restricting signal on #2 to couple to the rear of his train to go east on the Big Sandy Extension to Martin. 15. 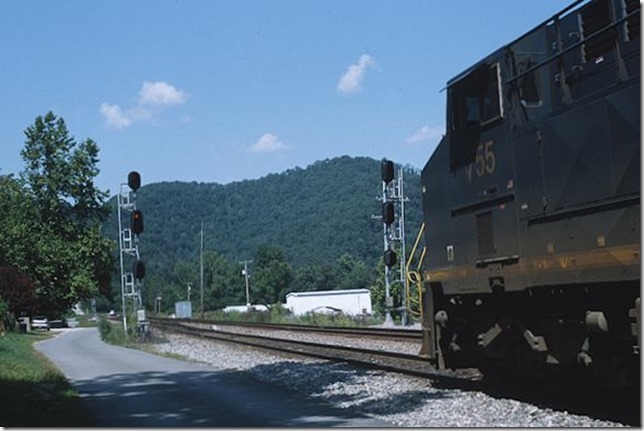 C882-25 with engines 878-755 pull up to the yard board at “Arkansas” with 110 DKPX empties. 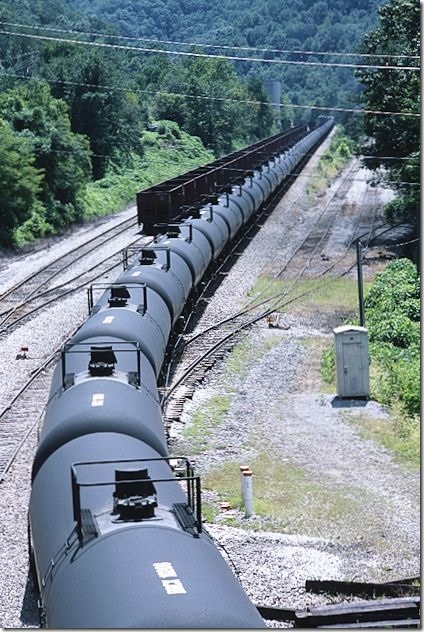 After talking to the yardmaster, they will proceed into the yard. 16. Back over at Beaver Jct., we catch this westbound AEPX coal train behind single 7644. 8-25-12. 17. Chase Freeman and I catch him again at Lancer passing the Onyx Coal tipple.